Chicago1 was awesome. I drove out with my Uncle Kit on Thursday and we got in Friday night. The was pretty much uneventful, lots and lots of flat land. We did stop by the Mississippi and take a picture! We spent most of Saturday working on building a bookshelf, with a side trip to buy a $102 extension cord. The extension cord was actually only $7, the pet rabbit and cage was $95. We went into Chicago proper on Sunday. 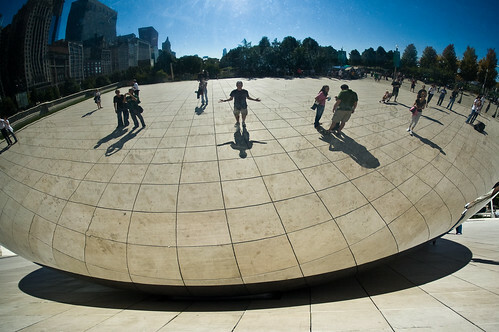 I saw The Bean (aka Cloud Gate) and we stopped at Wired’s NextFest. Giordano’s World Famous Stuffed Pizza for lunch. We made a quick stop at the Museum of Contemporary Art before heading back. On Monday, I rode the L the airport (took about two hours :-/). Not entirely sure where I’m going, I walked over to a United Departure screen and looked to see what gate my flight was departing from: Gate B17. I go to the ticket kiosk and get my ticket, which says gate C25. So, thinking that the gate was updated, I went to gate C25. I get there and the gates been changed, predictably. So I check the monitor again: Gate B17. So I walk over towards gate B17. I get to about Gate B10 when I realize that I’m an idiot! I’m not flying to Seattle, which is what Gate B17 was for, I’m flying to Denver! So I go back to the monitor and the flight to Denver is at Gate B22; disaster averted.